Document security is an important requirement in the modern print environment. In a standard environment a user's job prints immediately and can accidentally be collected by another user. This problem is usually addressed with Secure print release by implementing dedicated Release Stations, embedded MFD applications, or specialist hardware. PaperCut NG/MF's Mobile Print ReleaseMobile Print Release allows users to release held jobs directly from their mobile device (smartphone or tablet). provides an alternate, cost-effective solution that leverages the powerful devices that exist in almost everyone's pocket—the mobile phone. 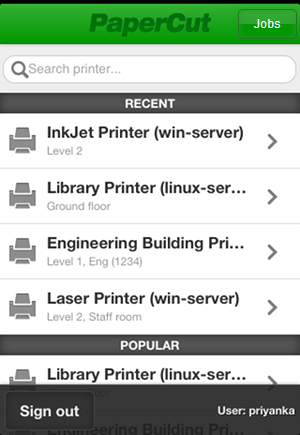 Once logged in, the user is able to see a list of printers that are available to them. The printer's name, location, and alternate IDAn alternate name for printers that normally provides more descriptive information about the location of the printer. (if set) are displayed. Mobile Print Release also displays recently used printers, as well as popular printers. Selecting a printer shows the held jobs that the user can release on the printer. The list includes jobs held in virtual queues that redirect to the selected printer. In the screenshot below there are no jobs available for release. In the screenshot below you can see there are many jobs available to release. Simple details such as the job name, cost, number of pages, and time that it was queued are displayed. Clicking the arrow next to a job displays more detailed information about the job. In the case where there are multiple jobs with similar names, users can use this information to differentiate jobs. If the user only wants the perform an action on a subset of jobs, they can use the checkboxes to the left of the job titles to either select or deselect them. By default, all jobs in the list are selected. Users can release or cancel the selected jobs by clicking either the green or red buttons at the bottom of the screen. Mobile Print Release offers secure release on any type of printer from a mobile device. A common configuration is to have two queues for a physical printer; one direct queue (normal printing) and one secure queue (a hold/release queue). When document security is important users can select the secure queue and release the job from their mobile phone. Alternatively, many sites want a 100% secure environment, mandating release on every job. You need to set up Secure print release to use Mobile Print Release. 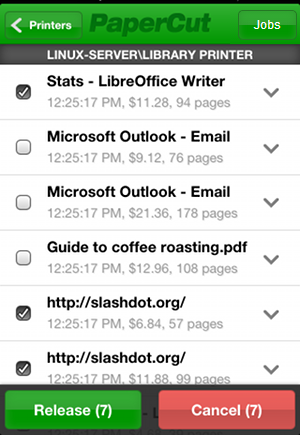 Mobile Print Release is a core feature included in PaperCut NG/MF. It's a mobile web application, which means there's no need for users to install 3rd party applications or access an off-site App store (such as Apple's iTunes store). The advantage of this model is that all network traffic and application deployment is managed securely in your own network. "/mr" is a shortened version provided for convenience. HTTPS is highly recommended, as users will authenticate themselves via this connection. By default, PaperCut NG/MF installs with a self-signed certificate and raises warnings in secure browsers. Consider installing a Generate SSL/HTTPS keys, or use the HTTP URL. We would recommend HTTP only as a secondary option, and only on secured WiFi. Users can bookmark or "Add to Home Screen" the Mobile Print Release app on their device to quickly access the application. Held job pages can also be bookmarked, which is convenient for users who often release from the same device. 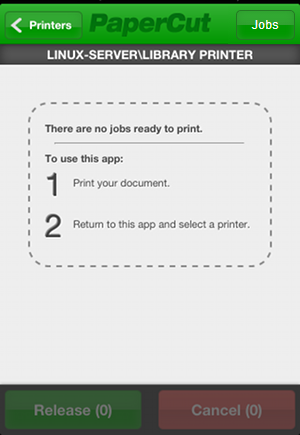 You can also deploy Mobile Print Release to iOS devices as an App. The user needs to access https://[servername]:9192/mr/install. This installs a web profile that automatically creates the home screen icon, which might be preferred to manual bookmarking on some sites. iOS users can also print directly from their device using iOS printing (iPad & iPhone). Use these two applications together to provide a comprehensive mobile printing solution. When implementing Mobile Print Release across a large network, it can be hard to educate the users of how and when to use the application. Many administrators have used stickers with URLs printed on them to direct users to access the application. Informational posters give administrators a more noticeable and detailed space to explain the enhanced printing architecture. Regular users of Mobile Print Release can improve their experience by bookmarking the printers that they use the most. When used in conjunction with the "Remember Me" option, users can release their jobs extremely quickly. This allows users to click a single icon on their mobile device and go straight to the held job list from which their print job can be released. Sites with hundreds of printers should educate their users to use the search function in Mobile Print Release. The Mobile Print Release printer search field provides a quick way for users to find their desired printer. The search terms are matched against the printer's name, location and alternate ID. Printer names are usually read on a computer screen, while alternate IDs are short, easy-to-remember details that users type on a mobile device. The alternate ID is an admin-defined code that you assign to a print queue. A suggested approach is to use a 4-digit code (for example 1234) as the alternate ID. You can then print labels that show the alternate ID and stick them on the printers so users know what term they should search for. The user uses their mobile phone to scan the QR code on the sticker on the printer. If the user has not previously authenticated, they are prompted to do so. The mobile's browser opens with a list of their print jobs. The user selects their jobs; then taps Release. The jobs print immediately. Below is an example of a sticker that is adhered to a printer. The QR code results in the URL https://printerserver:9192/mr/1234. Note that this URL uses the alternate printer ID of 1234 (See above). The following Mobile Print Release configuration keys are available. You can edit Configuration keys at Options > Actions > Config editor (advanced) . mobile-release.max-recent-printers The maximum number of recently used printers displayed in Mobile Print Release interface. These printers are the ones that have been recently used to release jobs via Mobile Print Release. It helps users in selecting their preferred printer quickly. The default value is 4.
mobile-release.max-popular-printers The maximum number of popular printers displayed in Mobile Print Release interface. These printers are organization's popular printers. 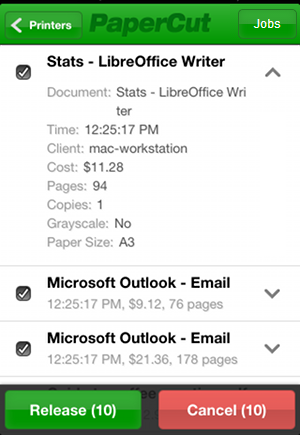 The default value is 3.
mobile-release.session-timeout-mins Inactivity timeout for Mobile Print Release interface. The value of 0 indicates that the session will never time out. The special value DEFAULT indicates that the PaperCut's default value will be used. The default value is 1440 minutes (24 hours). generate-printer-qr-codes Generate a QR code for each printer and saves the QR codes in a directory. 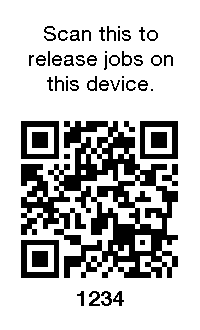 Users can use the QR codes from the Mobile Print Release app to release a job without having to log in to the device. See Using the Advanced Config Editor to find out how to change config keys. It is also possible to customize the logos and the look of Mobile Print Release. For more details, see Customize Mobile Print Release.